Founded at the Royal College of Music in London in 1994, the quartet is based in Great Britain. However, the Romanian violinist Corina Belcea and the Polish violist Krzysztof Chorzelski, the two founder members, bring a very different artistic provenance to the ensemble. This spectrum is extended by the French musicians Axel Schacher (violin) and Antoine Lederlin (violoncello). These musicians are not confined by traditional boundaries. Perhaps it is their diverse cultural backgrounds that help to create their dynamic and free interpretative style. Most of Franz Schubert's mid/late childhood was spent as a choirboy at Vienna’s Royal City College, and he was greatly influenced by their resident musicians, in particular Antonio Salieri. Bowing to pressure from his father, Schubert left the College in 1813 to train as a schoolteacher, but continued to take lessons with the older composer. Schubert's String Quartet in E flat major, D. 87 (No. 10) was written in November 1813, just after Schubert left the College aged 16. A mature, successful piece of work, it was misdated in the 19th century and thought to be from much later in Schubert's career. Shostakovich’s dramatic, sardonic, and elegiac String Quartet No. 8 is one of the 20th century’s great works. He dedicated it to the victims of fascism and war, but it’s also a pained self-portrait. The Quartet in D minor ‘Death and the Maiden’ is one of two large-scale string quartets that Schubert composed in 1824. The subtitle refers to his famous song of the same name, the melody of which he used here as the basis for a set of variations in the second movement. 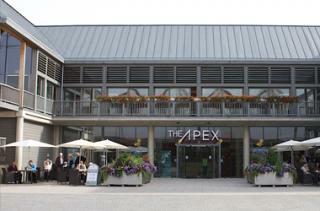 The concert at The Apex is on Monday 12 December at 7.30pm. Tickets are £20 and £15, with £5 tickets for those aged under 25. Ring the box office on 01284 758000 or see the website - www.theapex.co.uk for details.